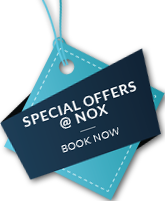 Nox Hotel Galway is located on the Headford Road, only a mile from Eyre Square in Galway City Centre, and a short distance from NUI Galway, Ballybrit Racecourse, University Hospital and business parks and industial estates. We offer complimentary parking for our guests, making us a great base for your Galway stay. Continue straight ahead through the next 3 sets of traffic lights. Approaching the Kirwan roundabout you will see Nox Hotel situated on the left. Simply take the first exit at the Kirwan roundabout, and entrance to the hotel is only a few hundred metres on the left.